This navy blue gown from 8D & PP Wedding featuring exquisited jewel embellishments and a deep-V neckline is irresistable! 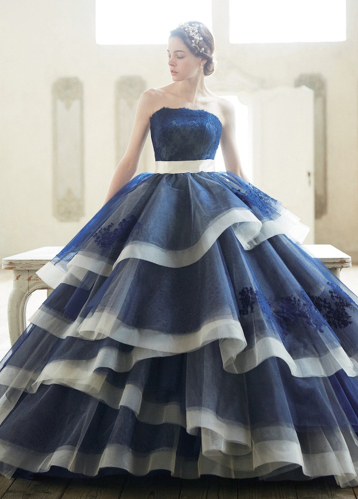 This navy blue ball gown from Scena D’uno featuring dreamy layers and lace detailing is breathtakingly beautiful! 8D & PP Wedding introduces this navy blue gown with glamorous 3D flowers! When navy blue meets peach, the result of this Crystal Design gown is both timeless and sweet! 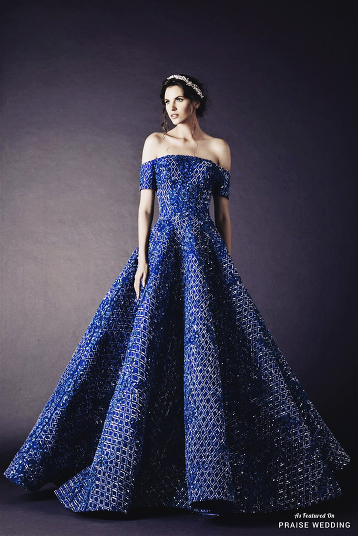 So in love with this navy blue off-the-shoulder gown from Rami Kadi featuring unique patterns and glamourous details!